Nebraska’s approval of an alternative route could throw more uncertainty into the mix for the long-delayed Keystone XL oil pipeline. The Public Service Commission approved TransCanada Corp.’s project on a three-to-two vote, removing one of the last hurdles to the Calgary-based company’s construction of the $8 billion, 1,179-mile (1,897-kilometer) conduit, which has been on its drawing boards since 2008. The decision, though, wasn’t wrinkle-free: The panel mandated an alternative route that was immediately targeted by the project’s opponents as lacking adequate vetting. TransCanada is now "assessing how the decision would impact the cost and schedule of the project,” Russ Girling, TransCanada’s chief executive officer, said in a statement. The company’s shares rose 1.3 percent to C$63.35 at 12:24 p.m. in New York trading. The uncertainty expressed by Girling was quickly reflected in analyst notes. "While today’s Keystone XL pipeline approval is an important milestone, it does not provide certainty that the project will ultimately be built and begin operating," said Gavin MacFarlane, a vice president at Moody’s Investors Service. “Pipeline construction would negatively affect TransCanada’s business risk profile through increased project execution risk, and would likely put pressure on financial metrics." Jane Kleeb, president of the environmental advocacy group Bold Alliance, said green-lighting the alternative may have helped the commission reach a "middle ground solution.” But it opens new questions that she said her group would likely explore in federal court. That view mirrored a dissenting opinion from Commissioner Crystal Rhoades. The alternative route needed more study on both the state and federal level, she said before the final vote, and it failed to give landowners along that different path the ability to address the commission. The decision came just days after a spill on TransCanada’s existing Keystone line in South Dakota on Thursday sparked new attacks by environmentalists who pointed to the event as something the state could expect if the project is approved. 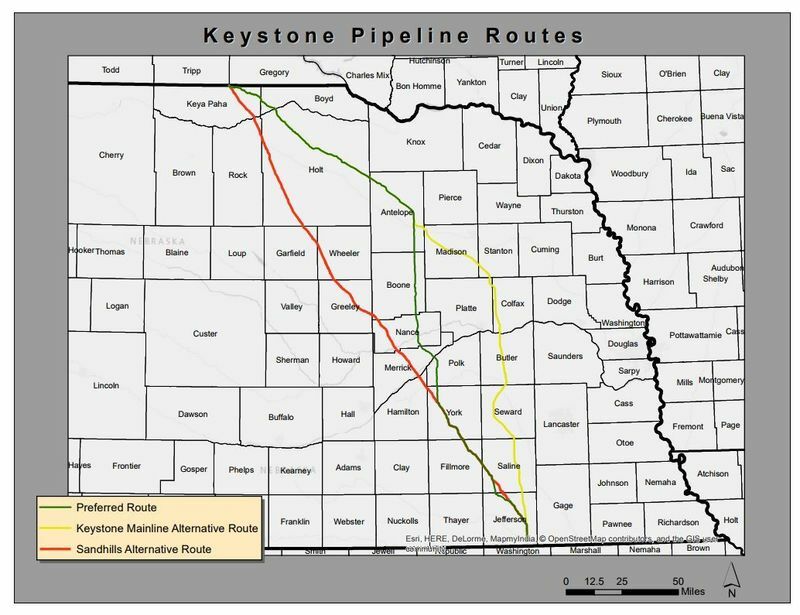 In its post-hearing brief, TransCanada told the panel its "preferred route was the product of literally years of study, analysis and refinement by Keystone, federal agencies and Nebraska agencies," and that no alternate route, even one paralleling the Keystone mainline as the approved path does, was truly comparable. 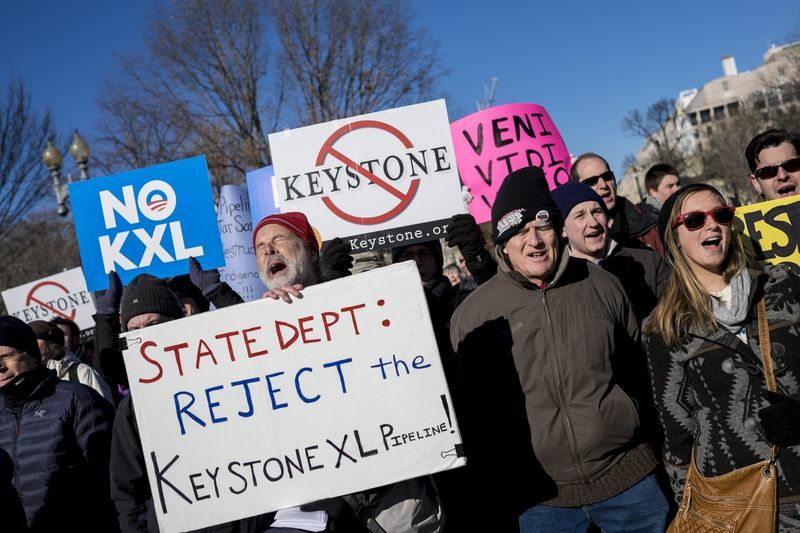 Demonstrators hold a rally against the Keystone XL pipeline outside of the White House on Jan. 10, 2015. Dennis McConaghy, former executive vice president of corporate development at TransCanada, said he would expect senior management to announce they will go ahead with the project by year’s end with construction by the later half of 2019. Completion of the line would come a couple years later. “The project could have been very seriously set back if they hadn’t got this approval today,” he said. With Nebraska’s go-ahead in hand, TransCanada still must formally decide whether to proceed with construction on the line, which would send crude from Hardisty, Alberta, through Montana and South Dakota to Nebraska, where it will connect to pipelines leading to U.S. Gulf Coast refineries. The XL pipeline would add the ability to move 830,000 barrels a day, more than doubling the existing line’s capacity. President Barack Obama’s administration rejected the pipeline in 2015. President Donald Trump vowed to reverse that determination and, in January, invited the company to reapply. Approval was quickly granted. He also championed completion of the Energy Transfer Partners LP-led Dakota Access Pipeline, which runs from northwestern North Dakota to Illinois via South Dakota and Iowa. The panel heard testimony and took in evidence during a four-day August hearing. Its power over the project is drawn from the state’s constitution. The case is In the Matter of the Application of TransCanada Keystone Pipeline LP for Route Approval of the Keystone XL Pipeline Project, 0p-0003, Nebraska Public Service Commission (Lincoln).